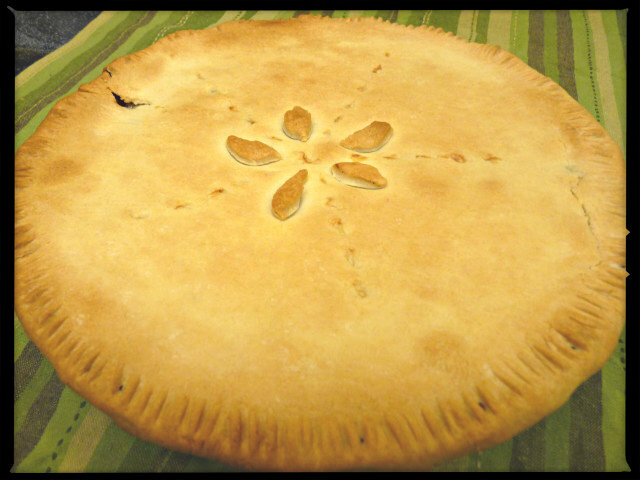 A potpie is a baked savoury pie, with a top and bottom consisting of flaky crust, in which a vegetable or meat filling is enclosed. You can always buy a chicken potpie from the nearest bakery, but creating your own homemade pie is an easy and fun activity, which can save you a lot of money as well. You can have a slice of this pie as a snack, or serve it whole for dinner. Start by preparing the filling for the pie. Spray a large non-stick skillet with cooking spray and melt one teaspoon of unsalted butter in it over medium high heat. Add the chopped onion, peppers, and minced garlic to the skillet, and sauté for five minutes or until the onion is soft and translucent. Stir in the ground coriander and cumin seeds, and cook for a couple of minutes. Then, pour in ¼ cup of cider vinegar and stir to mix. Scrape the bottom of the skillet gently with a plastic or wooden spatula to loosen browned bits, if any. Add the cooked, shredded chicken breasts, brown sugar, grated unsweetened chocolate, and chilli sauce to the skillet, and toss to combine all the ingredients. Pour the chicken broth into the chicken mixture, and cook for 12 to 15 minutes, or until thick, stirring occasionally. Meanwhile prepare a 11x7 inch baking dish by spraying it with cooking spray and dusting it lightly with all purpose flour. Spoon the chicken mixture into the prepared baking dish, spreading it evenly with the help of a spatula. Open the corn bread dough can and separate the strips. Cover the chicken mixture with these strips in a lattice fashion and bake for 25 minutes, or until golden brown, in an oven preheated at 375 degrees Fahrenheit. Remove the pot from the oven when done, and allow it to cool for 15 minutes before serving.